Slice butternut squash in half and drizzle with maple syrup. Place face-down on a cookie sheet. Roast for about half an hour or until skin can be pierced with a fork. Scrape out seeds and discard. Preheat a large pot and place the sliced beef fry at the bottom. Let cook for about five minutes, letting the fat fry and the meat shrivel up. Remove from pot and set aside on a paper towel (do not wash the pot). Add the remaining ingredients, letting the piece of smoked meat cook along with the rest of the ingredients. Simmer for 45 minutes to an hour. 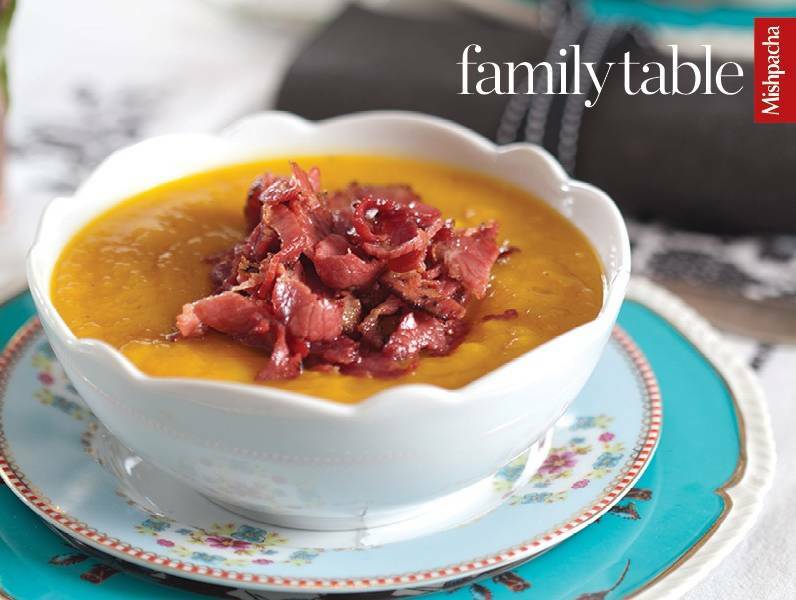 Let soup cool and remove the piece of smoked meat. Blend with an immersion blender. Taste for seasoning. If making ahead, plan to rewarm before serving. If soup is too thick, add chicken stock until desired consistency is reached. Throw the pieces of cooked beef fry back into a pan for one minute to reheat. Garnish with a spoonful of the fried meat. I often like to add some other squash into the mix just for some variety. I especially like delicata squash. Just substitute amounts of butternut squash.